When comedian Volodymyr Zelenskiy announced at midnight on New Year's Eve that he was running to be president of Ukraine, many pundits dismissed the move as a public relations stunt. Zelenskiy, 41, is a household name in Ukraine — until recently, he starred in a hit television series as a corruption-averse history teacher who is elected the country's leader. Now, the man who has no political experience and few clear policies appears to be on the verge of replacing the real-life incumbent. Campaigning on little more than his charisma and a desire for change, he won the first round of the country's presidential election last weekend. Most opinion polls suggest he will beat President Petro Poroshenko by a considerable margin in the April 21 runoff. 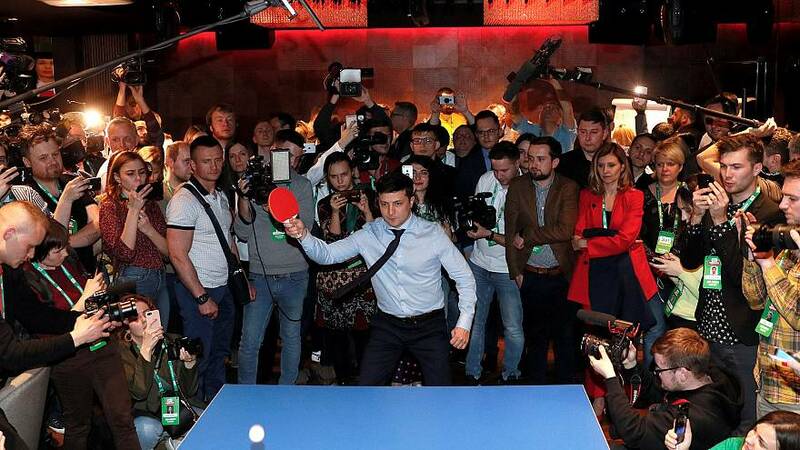 Zelenskiy appears set to follow the trend of candidates and parties around the world who are coming out of nowhere to topple establishment figures. Although the most notable is Donald Trump's presidential win in 2016 — quickly morphing from a businessman and reality TV host to leader of the free world — there are plenty of other examples. The Five Star movement, Italy's largest ruling party, was founded by comedian and blogger Beppe Grillo, and Prime Minister Giuseppe Conte was an unknown lawyer before his appointment. Zuzana Čaputová who was just elected Slovakia's first female president was also an activist-lawyer and a political outsider. And even French President Emmanuel Macron, despite being involved in politics for some years, shocked Europe when he ousted the traditional parties with his En Marche! movement in 2017. Social media has been key in allowing these interlopers to gain notoriety that would have been impossible even a decade ago, when traditional media acted as a de facto gatekeeper for most hopeful upstarts. "The media environment moves much more quickly and much more widely and these people can pick up traction very fast," said Scott Lucas, a professor of politics and American studies at the University of Birmingham in England. "If you take advantage of the 21st century media, you've got free advertising." Zelenskiy has deployed this tactic with devastating effect for his opponents on the trail. "We have one platform only — that's the internet," campaign team member Michael Fedorov, 28, told Reuters earlier this week. When it comes to Zelenskiy's policies, "his appeal is that of a blank check," Dmitri Trenin, the director of the Carnegie Moscow Center think tank, said. The comedian has been vague about what he stands for, and his image as "everyone's hope for a better future" is a strategy that he needs to maintain to win the runoff, Trenin said. Zelenskiy has not even revealed who would form his inner circle as president — but has promised to reveal five names before the runoff. 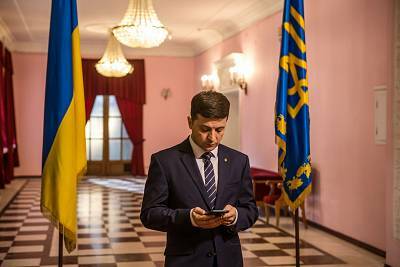 Granting almost no interviews to the domestic or the international media, Zelenskiy has relied on social media to broadcast his message. Earlier this week, he used a Facebook post to challenge Poroshenko to a debate at a 70,000-seat stadium in Kiev. Whichever candidate is elected will need to deal with the increasingly belligerent actions of Russian President Vladimir Putin. Poroshenko declared martial law in parts of the country in November after Russia fired at, rammed and then captured three Ukrainian ships. At the time, Poroshenko insisted his country was facing the "extremely serious" threat of a land invasion by Putin's troops. Anna Korbut, a fellow with the Russia and Eurasia program at the London-based Chatham House think tank, says many Ukrainians have enthusiastically supported Zelenskiy without demanding any answers from him. "It's sort of messianic behavior, both from him and from his voters, which doesn't bet on reasonable or critical assessment of his policies, agenda or team," Korbut said. Throughout the campaign, pundits have been adamant that voters are tired of incompetent, old-school politicians. The narrative has been that people want someone new to take the helm, regardless of experience. Zelenskiy has been able to capitalize on that. Hisofficial platform is more of a representation of moral values than a list of concrete plans. "People imagine what they want in Zelenskiy: Liberals think he is a liberal, patriots think he is a patriot, leftists think he is a leftist," political strategist Olexiy Golobutskiy told NBC News in February. Meanwhile, Poroshenko has been abundantly clear about where he stands. The 53-year-old billionaire confectioner has cast himself as the only man who can prevent Ukraine from becoming a Russian vassal state. For years, he has been lobbying Ukraine's inclusion into the European Union and NATO. He also makes no bones about his distaste for Putin. But economic turmoil during Poroshenko's five-year term appears to have left voters looking elsewhere. Many people consider him a member of the same corrupt political elite that failed to enact reforms widely expected in the wake of the mass protests that toppled Ukraine's pro-Russian government in 2014. "Poroshenko's appeal may be that of a 'devil we know,'" Trenin, of the Carnegie Moscow Center, said. "Things may not be fine, but at least we know what the guy is up to. Poroshenko may succeed, improbable as it may look, by drawing Zelenskiy out on specific issues." In the run-up to April 21, Poroshenko is likely to stick to his tactic of invoking apocalyptic scenarios and heightening fear over Russia's aggression, according to Kiev-based political analyst Valentyn Gladkykh. He highlighted that Zelenskiy had stayed away from negative messaging. "The choice of Zelenskiy was a choice in favor of an uncertain future as opposed to a definite and unsatisfactory present," Gladkykh said. Arsen Avakov, who serves as Poroshenko's interior minister, has called Zelenskiy "a decent person from another dimension." But in an interview with the Ukrainian news site lb.ua, Avakov also said that Zelenskiy is someone who "admits he is not quite competent in many areas." Some European allies have also expressed concerns about Zelenskiy's ability to handle a crisis. If elected, he will also have to assume the role of commander-in-chief and make important decisions should tensions with Moscow escalate. "Amid its conflict with Russia and its difficult economic and social situation, Ukraine can't allow itself to bank on an inexperienced leadership," Johann Wadephul, a lawmaker with Germany's ruling CDU party, said. Wadephul urged Zelenskiy to "concretely show what he stands for" before the runoff. Zelenskiy is on the record as saying that the war in eastern Ukraine, which has dragged on for years and claimed almost 13,000 lives, needs to stop. To make that happen, he vowed to directly negotiate with Putin. He thinks Crimea, which was annexed by Russia in 2014, is indisputably Ukrainian. But he hasn't provided any answers on how to get the peninsula back. And only as he watched election results roll in Sunday night did Zelenskiy start sounding bolder in his statements on Russia, claiming that he would demand monetary compensation for "taking away our territories" if he meets with Putin once elected. 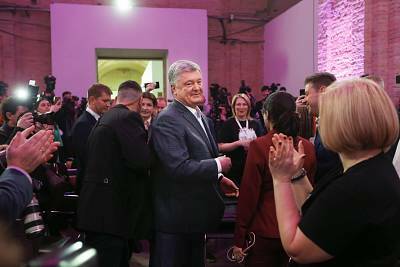 Meanwhile, German Chancellor Angela Merkel telephoned Poroshenko and personally congratulated him for advancing into the runoff — a move that was deemed unusual by many in Ukraine due to the fact he finished behind Zelenskiy. Kostyantyn Gryshchenko, a former foreign minister, told Ukraine's 112 TV channel Tuesday that some world leaders are cautious about Zelenskiy because there is little understanding about who he is. "And that doesn't inspire a lot of confidence about what to expect from him," Gryshchenko said.